As I am sure you have heard on the news, on Friday 12/14, a federal judge in a lower court in TX filed a decision that declared the Affordable Care Act to be unconstitutional. His decision hinged on the fact that last December's tax bill the fine for not obtaining health insurance was reduced to zero. The decision held that since that fine has bee reduced to zero, that "tax" has been functionally removed from the law. The reason this argument matters is that when the Supreme Court evaluated the constitutionality of the ACA previously, it determined that in fact the government did have the authority to compel Americans to have health insurance coverage, citing the Constitution granting Congress the authority to tax and spend. In yesterday's decision, the judge determined that since the "tax" has been reduced to zero, that authority has been relinquished and therefore the whole law must be struck (because of the argument that the taxing authority granted to Congress was the sole reason that it was able to compel Americans to have health insurance--and that the existence of the entire law hinged upon the taxing authority). The ruling will not impact the 2019 health insurance plans sold through the exchange/marketplace of healthcare.gov or the state equivalents. It also won't immediately affect Americans' health coverage. The most immediate impact could be upon whether or not states will continue to consider expanding Medicaid at a time when the effort might be for naught. An appeal is inevitable and already being discussed by a group of states led by California. They are likely to argue that the amount of the fine is immaterial, and that the $0 amount is not the equivalent of repealing the tax/fine and that the law still contains (and has the authority to impose) a fine. Because of the high stakes, and the political aspect of the law, the appeal process is likely to make its way to the US Supreme Court. This will take time. If the US Supreme Court upholds the argument that the entire Congressional authority hinges on whether or not there is a tax/fine of more than $0 imposed upon those who do not have health insurance coverage, then the entire law will be invalidated. If that is the case, Americans will lose pre-existing condition protections, the ability of folks to stay on their parents' health insurance up to age 26 and other provisions of the ACA that have recently become popular on both sides of the aisle and the preservation of which has been a PPS legislative priority. In a closely watched case, Judge Reed O’Connor of the Federal District Court in Fort Worth, Texas ruled that the Affordable Care Act's individual mandate, which Republicans zeroed out with their tax bill, “can no longer be sustained as an exercise of Congress’s tax power.” And the rest of the law cannot be separated from that provision and is therefore invalid, he wrote. PPS’ legislative priorities call for us to address and mitigate the negative effects associated with physician self-referral. In August, PPS filed formal comments in response to CMS’ RFI on physician self-referral. On October 26th, PPS filed formal comments with the Department of Health and Human Services’ Office of Inspector General urging both limits to the use of beneficiary incentives as well as transparency if providers are offering incentives to retain or induce patients to choose a particular provider. In both comments, PSS urged the prompt removal of PT from the IOASE and requesting increased accountability and transparency for referrals made utilizing the IOASE. Each fall, PPS members exercise their voting rights by electing new leadership to serve the Private Practice Section, APTA. This year, online voting began on October 5th and will close November 2nd. Those who are present at the PPS Annual Conference and Exhibition in Colorado Springs will be given the opportunity to vote onsite at the PPS booth November 8-9th. All PT and PTA members are eligible to vote. The 2018 Slate of Candidates is shown below. Each candidate was unanimously approved by the PPS Nominating Committee and Board of Directors. PPS believes that each of these individuals will uphold the mission of the Section, and that they possess the background, talent, adn character required to acheive the goals established in the PPS strategic plan. In December 2017, the Tax Cuts and Jobs Act provided for a permanent flat 21% tax rate for corporations. Under the law, qualified trades or businesses such as private practice physical therapists who pay their business taxes through their individual tax returns may be able to utilize a 20% tax deduction on qualified business income. The Department of Treasury has proposed to add physical therapists to the list of Specified Service Trades or Businesses (SSTB). If categorized as an SSTB, a physical therapist would NOT be eligible for the Code Section 199A deduction UNLESS their income was below $157,500 as an individual or $315,000 if married filing jointly. Once an income passes these initial thresholds, the deduction phases out for those whose incomes are between $315,000 and $415,000 for married taxpayers who file jointly and between $157,500 and $207,500 for single taxpayers. The deduction would not available for those whose income exceeds $415,000 (if married filing jointly). PPS commented on the proposed rule, arguing that physical therapists should be treated as general qualified trades or businesses and not be added to the SSTB definition. Should the final rule not make the changes proposed by the Administration, a larger number of private practice section members would be able to utilize the 20% pass through tax deduction. Please consult your tax professional for advice as this tax break impacts the tax year beginning January 1, 2018. The PPS Administrators' Network was formerly known as the PPS Administrators Council. All members of the PPS Administrators Council have retained their active membership status and login credentials with the Administrators' Network and need not reapply. PPS is more than a network of PTs, PTAs, and students. Every physical therapy clinic is home to at least one administrator who serves as the first point-of-contact for patients, oversees marketing, ensures compliance and proper coding, and more. PPS has a built a home for these invaluable staff with the PPS Administrators’ Network. Give your administrators and office managers the resources, education, and networking opportunities they need to serve your practice best by giving them a membership to the PPS Administrators' Network. Give your administrators and office managers the resources, education, and networking opportunities they need to serve your practice best by giving them access to the PPS Administrators' Network. ACCESS TO THE CERTIFIED ADMINISTRATOR PROGRAM Administrators who complete and pass the Administrators' Certification coursework are proficient in Billing & Coding, Legal Compliance, Human Resources, Business Operations, Marketing, Customer Service, and Financial Management. After successful completion of 12 hours of coursework covering the above topics, students are tested on their knowledge and, if they pass, will be recognized as a PPS Certified Administrator. The certification coursework is available at PPS Annual Conference. FREE QUARTERLY WEBINARS Designed to keep administrators up-to-date on the latest billing and coding information, compliance issues, marketing trends, and other relevant topics. PEER NETWORKING OPPORTUNITIES As a PPS member, you understand the value of peer networking, collaboration, and mentorship. Administrators' Network members enjoy the same benefits through in-person networking events, an exclusive online community, and membership directory. LEADERSHIP DEVELOPMENT All Administrators are encouraged to participate in the development of the Network and its strategic initiatives through volunteer participation in committees and task forces. FULL ACCESS TO PPS MEMBER RESOURCES Administrators' Network members receive the same discounts on educational conferences and materials as PPS members, they gain full-member access to the PPS website, and their own subscription to Impact Magazine where they can read articles written by their colleagues in Impact's Administrators Edge Column. The Administrators' Network welcomes all non-PT office managers and administrators employed by PPS members to be a part of the largest network of physical therapy clinic administrators in the country! In this 5-module, video series, learn how to define your target audience and develop a brand promise that engages customers. Discover marketing best practices, and tools to develop your marketing plan and accompanying budget. Finally, take a deep dive into three marketing strategies proven effective in marketing a physical therapy practice. Operations 101 provides an introduction to Key Performance Indicators and outlines the standardized definitions of recommended KPI's used to manage physical therapy practices. In modules two and three of this 3-part series, participants will learn how to use data and metrics to successfully manage practice operations, and will develop a strategy to create successful KPI performance. Finance 101 is a free, multi-module, video series that provides a solid foundation for those managing the finances of a physical therapy practice. The series was designed for non-financial people to gain improved understanding of bookkeeping methods, financial statements, and key terms requisite to successfully managing the finances of a physical therapy practice. Three years after being elected President of the American Physical Therapy Association, Sharon L. Dunn, PT, PhD, stood before the House of Delegates and delivered an invigorating address to the body of electorates who first voted her into leadership back in 2015. At the heart of her message was a repeated and compelling charge to act as she emphasized that it is not enough to call out inadequacies in the system, or to idly tweet about embracing change or promoting inclusion. No, she reiterated that as a profession we must band together and work collaboratively to secure the future of our profession. “Most of us in this room wear those battle scars—and quite proudly. But where our past was shaped with sharp elbows, our future must be shaped with open arms. Where our origins situated our profession in recovery and the treatment of disorder, our future will be characterized by an increased role in sustaining health and proactively preventing disability and disease. And where previously we have demanded respect in part by staking out turf and occasionally pointing to the shortcomings of others, in our future we will demonstrate our value based on the irrefutable data of our own outcomes and in partnership with our colleagues across disciplines. The health care system and our patients will demand nothing less." “We should approach our future with enthusiasm, not dread, because our profession has never been satisfied with our position within the status quo. Our existence has been one of almost constant self-challenging evolution. Our progress has never been inevitable; it has always been hard-earned. So if we truly desire to not only see society transformed but to shape that transformation, we must not only weather the storm of health care disruption. Instead, as Dr Alan Jette urged in his 2012 Mary McMillan Lecture, we must face into the storm and choose questing over resting. "We cannot transform society through judgment. Our vision charges us not to stand at a distance and point our fingers at our nation's ills but instead to accept a personal responsibility to try to make a difference. "At our core, we are healers, and as much as ever our country and our society need healing. It is not enough that we tweet about it in judgment. It is not enough that we adopt policies that articulate our principles. It is not enough that we sit idly by, in the comforts that were afforded by those who forged the path before us. "No, our history tells us that when we stand together and act, we are a force." "To fulfill our mission, our community must vastly improve our diversity by being intentional about inclusion. We must prioritize listening and learning. We must enable the next generation of physical therapists and physical therapist assistants to transform our association, just as our association must transform society. Most of all we must get involved—with open arms and open minds—not only as a community, but as individuals." "When we formally charge APTA to act, or simply daydream about "what APTA should do...," we sometimes behave as if we're writing a check for someone else to cash. But as an individual membership association, we are charging ourselves-we are writing our own to-do list. APTA is not a distant factory that churns out ready-to-order physical therapy progress on a conveyor belt. It's a community of physical therapists, physical therapist assistants, and students. It's our community. We are APTA, and APTA is us. Our association's growth, commitment, and determination cannot outpace our own personal development." "If, like I do, you anticipate a day when physical therapists, like dentists, are part of our society's regular health routines, don't just point the way—raise a hand and accept a portion of responsibility to take us there. "If, like I do, you believe that we gain strength not just with increased membership but with greater engagement, find a colleague who isn't as involved and demonstrate the spirit of inclusiveness our community requires. "If, like I do, you believe that the power of our profession is boundless, that it can optimize movement and health in every corner of the world, then dare to look beyond traditional delivery and payment models; our patients and clients are likely just as frustrated by the limitations of the status quo as we are, and they are eager for the precise and personalized service we can provide. "Above all else, if you believe, as I do, that our profession is more educated and skilled than ever before, that our potential is greater than it has ever been, then join me in demanding that we provide only the highest quality of care and that we are immediately accountable when the data suggest our patients and clients deserve something better." APTA President Sharon L. Dunn, PT, PhD, Board-Certified Orthopaedic Clinical Specialist, was reelected to a second 3-year term, June 25, 2018. To read the full transcript of her 2018 address, or to watch the video, visit the APTA website. The monthly toolkit is made up of free, ready-to-Share, professionally written, content for marketing your physical therapy practice to your community. We have monthly newsletters/blog posts, social media posts, and press release templates that can be copied and pasted, or customized to your practice with some simple edits. This month's theme, "Promoting the Annual PT Exam," encourages readers to schedule an annual PT exam with their family physical therapist. You are encouraged to take advantage of the newsletter, press release, and social media posts, in your own promotions of the annual PT exam. If you have questions about how to incorporate a press release into your marketing plan, or how best to use the press release template provided each month by PPS, refer to this article by Michelle Collie, PT, DPT, MS: "Press Releases: Your Top Six Questions Answered." 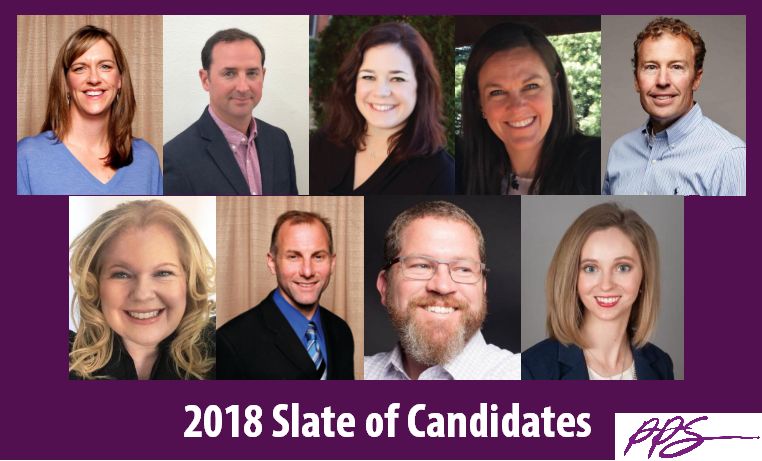 The Private Practice Section, APTA introduces the 2018 Slate of Candidates for your consideration. These candidates were unanimously approved by the PPS Nominating Committee and Board of Directors. PPS believes that each of these individuals will uphold the mission of the section, and that they possess the background, talent, and character required to achieve the goals established in the PPS strategic plan. Voting will take place onsite at the 2018 Annual Conference and Exhibition in Colorado Springs, CO, November 8-9, 2018. Online and absentee voting will take place in October. Registration for the 2018 Private Practice Section Annual Conference and Exhibition is now open. Physical Therapists from around the globe will join PPS members at The Broadmoor in Colorado Springs for the nation’s leading Physical Therapy Business Conference. Attendees will have the opportunity to rub shoulders with industry leading experts, entrepreneurs, students, administrators, academics, vendors, and world-renowned speakers. Take the opportunity to network and learn with this high talent group of health care leaders by registering the 2018 PPS Annual Conference today. Early bird rates will expire on August 8th 2018. Miss a Webinar? Listen to the Recording! The Private Practice Section hosts online learning events each month geared toward the professional development of physical therapists, physical therapist assistants, and their practice administrators. These events are open to the public, and all are encouraged to attend to get a taste of the benefits the Private Practice Section has available to you. PPS live webinars cover a wide range of topics that, when collectively applied, will prepare all who are employed in physical therapy with the business skills required to ensure the success of your practice. Utilize data to set goals, track progress, and ultimately increase ROI. Upcoming PPS webinars are posted on our Education Calendar and emailed to members each Wednesday. Following the live event, the recording of each webinar is stored publicly in the PPS learning center. PPS members can access these recordings by logging into their Learning Center accounts. Quality and Compliance: What is their value and how do they intersect? In the early morning hours of February 9th, the permanent repeal of the therapy cap was included in the spending bill passed by both the House and the Senate. President Trump then signed the bill into law. The legislation eliminates the cap on physical therapy (PT) and speech-language pathology (SLP) services, and the separate cap on occupational therapy (OT). The new policy requires that the KX modifier indicating services are medically necessary must be included once therapy spending reaches the $2010 level. This amount will be adjusted annually. Bills can be denied if the KX modifier is not used on claims which exceed the $2010 threshold. At the $3000 threshold, there is the potential of a targeted medical review triggered by factors such as one is a new Medicare-enrolled provider, an aberrant billing as compared to their peers, or belongs to a practice whose partners have been flagged for aberrant billing. The $3000 amount will also be adjusted annually according to the Medicare Economic Index (MEI), beginning in the year 2028. The fix will be retroactively applied to all therapy expenses incurred starting January 1, 2018. The budget deal also includes a pay-for that PPS did not support and worked hard to change after it was announced at the last minute. The law allows for a reduction in Medicare Part B payment for services in which a physical therapist assistant (PTA) is involved. Beginning January 1, 2022, payment for services provided by a PTA, as well as services provided by an occupational therapy assistant (OTA), would be paid at 85% of the Medicare fee schedule. This policy was not part of any of the discussions or negotiations with Congress over the past year, nor was it included as part of the proposed package of pay-fors that were announced this past fall as part of the bipartisan, bicameral agreement. PPS worked with APTA and AOTA to provide alternative proposals to eliminate, reduce, or delay the PTA and OTA payment differential, but each of these legislative options was rejected. Going forward, PPS will work with together with APTA to convince CMS and our Congressional champions to reduce the impact of this unexpected pay-for. For a complete summary of the therapy cap repeal and replace legislative language and policy, visit the PPS Legislative Updates Blog. By now, most physical therapists (PTs) have heard the news: the final 2018 Medicare Physician Fee Schedule (PFS) released in early November by the US Centers for Medicare and Medicaid Services (CMS) included some significant variations from the PFS regulations the Agency proposed in July. Instead of finalizing CPT code values that were the same as—and occasionally higherthan—current values, CMS opted to offer up a more complicated combination of cuts and increases that could affect PTs in different ways, depending on their case-mix and billing patterns. What should PTs do in the wake of the new PFS? Here are APTA's top 4 suggestions. It's important to understand what led to the changes to provide context, why despite our disappointment we are also experiencing a slight sense of relief, and a reminder of why payment needs to move toward value-based models and away from fee-for-service. The PFS set to go into effect on January 1, 2018, is the CMS response to an American Medical Association (AMA) committee's recommendation on potentially "misvalued" codes associated with a wide range of professions, not just physical therapy. When the process began in early 2016, many predicted that the final outcome would be deep cuts to nearly all valuations—as much as 10% or more overall. APTA, PPS, and its members fought hard to substantiate the validity of the current valuations, and even the need for increases in some areas. The end result was a significant improvement from where things were headed at the start of the process. That's not to say it's been an entirely satisfying process from start to finish. This recent article goes into more detail about the sometimes-frustrating journey from points A to B. One important thing to understand is that code valuation is actually made up of 3 separate elements, known as relative value units (RVUs). These are estimations of the labor, expense, and possible professional liability involved in performing any given treatment or evaluation task associated with a CPT code. The 3 types of RVUs are known as "work,"
"practice expense" (PE), and "professional liability." The coding valuation differences between the proposed and final PFS were due to changes to the PE RVUs only. While the AMA Relative Value Scale Update Committee Health Care Professions Advisory Committee did recommend changes to PE RVUs, CMS’s proposed rule rejected those suggestions. When the final rule was released 3 months later, CMS—without reaching out to APTA, PPS, or any other stakeholders—did an about-face and adopted the changes to PE RVUs. What affect does this have on your practice? The answer is twofold: first, the tweaks to PE RVUs mean it's difficult to make many sweeping generalizations about how the new PFS will affect individual practices and clinics; second, it's worth noting that individual work RVUs either remained unchanged or increased. A more detailed explanation of how the codes were affected is available in an APTA fact sheet on the 2018 PFS (listed under "APTA Summaries and Fact Sheets"). For a more complete explanation of RVUs and the differences between the 3 types, check out this APTA podcast on the CPT valuation process. It's a mixed bag, in terms of adjustments to current procedural terminology (CPT) codes commonly used in physical therapy, with some values going up, and others being cut. Physical therapy isn't the only profession that saw CPT code reductions: otolaryngolists, nurse anesthetists, and urologists, to name a few, are also bracing for cuts. It could have been a lot worse - up to a 10% cut or more based on changes to the practice expense. Statements 1-3 aren't much consolation when you're a physical therapist (PT) facing estimated average payment reductions between 1.3% and 2% (but again, this is hard to pinpoint: there will be increases, but in other cases decreases will be even worse). Just a few months ago, the outlook was good for PTs when it came to the 2018 PFS. After a 2-year American Medical Association analysis of CPT codes that CMS believed may be potentially "misvalued," the proposed rule that emerged this summer was a clear win for the profession: the proposal contained no cuts to codes values, and even a few increases. From the perspective of the profession, the proposed rule adopted all of the positive recommendations from AMA—namely, no cuts and a few increases to work relative value units (RVUs)—and none of the damaging AMA’s Health Care Professions Advisory Committee (HCPAC) recommendations, which included adjustments to practice expense (PE) inputs that would affect payment. Things were looking good, and APTA, PPS, and its members advocated strongly for the rule as proposed. When the final rule was issued in November, things stopped looking so bright. Between release of the proposed rule in the summer and publication of the final version, CMS veered away from its typical process when it announced—without warning and without allowing opportunity for input from any stakeholders, including APTA and PPS—that it would reverse its decision, and instead of rejecting, it would adopt the recommendations related to PE inputs. The rule change has altered the payment landscape for PTs in ways that are still being worked out by APTA. The association has published a summary of the rule on its website (listed under "APTA Summaries and Fact Sheets"). While it's true that the final rule will result in increases in some areas, some of the payment reductions that will go into effect next year will hit home for some PTs. What is known for certain is that a few of the most commonly used codes in physical therapy will see a drop, including manual therapy, therapeutic exercise, mechanical traction therapy, and aquatic therapy. At the same time, other codes will increase—some significantly. Gait training therapy values will increase, as will neuromuscular reeducation, and therapeutic activities. The 3-tiered evaluation codes adopted by CMS in 2016 will also rise, in addition to orthotic management and training (first encounter), and prosthetic training (first encounter). APTA is putting final touches on a calculator that will help members get a more precise estimate of the potential impact of the new rule, given their particular practice circumstances. The calculator is set to be released early next week. "While it's clear that the CMS reversal from its proposed rule will result in drops to some of the codes used frequently by PTs, the bottom line effects of the new rule will vary depending on case mix and billing patterns," said Carmen Elliott, MS, APTA vice president of payment and practice management. "The overall 2% drop estimated by CMS doesn't take that variation into account. There will be some providers who will see reductions in payment of anywhere from 1% to 2%, but we anticipate that others could see overall increases." "This is frustrating, both in terms of the payment reductions as well as the way in which CMS surprised stakeholders with its reversal from the proposed rule. The cuts will be hard on some physical therapist practices," said APTA Vice President of Government Affairs Justin Elliott (no relation to Carmen Elliott). "It’s also true that the initial projections, long before the initial proposed rule, were far more bleak." Justin Elliott is referring to the way CMS handles codes that it believes may be "misvalued"—often read as a euphemism for "overpaid." It's a complex, multi-year process overseen by the AMA's Relative Value Scale Update Committee (known as RUC) Health Care Professions Advisory Committee (HCPAC). The RUC HCPAC engages in dialogue with stakeholder groups, including APTA, thenconducts surveys of individual providers before issuing recommendations on how codes should be valued. The survey of PTs was conducted in October 2016. When the process began in early 2016, indications were that overall, CPT codes commonly associated with physical therapy could see a double-digit cut. APTA staff and CPT advisors worked with the RUC HCPAC to move recommendations away from that potentially catastrophic change, and survey responses from PTs helped to reinforce the notion that current code values were not far off—at least in terms of averages across all codes. Given where things seemed to be headed in 2016, the release of the final rule, though far less than ideal, does amount to a win—of sorts. And context is important: physical therapy wasn't alone in professions with codes on the CMS chopping block, with otolaryngologists, anesthesiologists, nurse anesthetists, urologists, and vascular surgeons all seeing overall code reductions between 1% and 2%, according to CMS estimates. According to Justin Elliott, "APTA is exploring all avenues to advocate against these cuts before they take effect on January 1, 2018." He added "All options are on the table and every path is being evaluated for our response to CMS’s final rule." Those advocacy efforts will require APTA, PPS,and its members to have a solid understanding of just how the CPT changes impact them during the coming year, according to Carmen Elliott, who said that the key to getting insight on the effects is for PTs to continue to code and document appropriately while they evaluate their case mixes and other factors. "The only way to truly understand the effects of these changes is for our coding efforts to remain consistent," she said. At the same time, APTA President Sharon Dunn, PT, PhD, thinks that there's an even bigger picture to be considered. PPS President Sandra Norby, PT, DPT is looking at both the trees and the forest. Have an item to contribute to this page for PPS members?